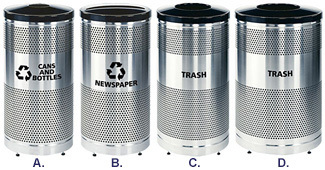 Designed for recycling, these fire safe heavy gauge stainless steel trash receptacles come with black tops specifically designed to accommodate glass, paper or trash. The black decals are ordered, sold, and shipped separately. Any of the 3 decals can be ordered with any receptacle. Leg levelers and large plastic liner are included. Optional anchoring kit is available. Black Decals are Sold Separately!